CAMBRIDGE, Mass.--(BUSINESS WIRE)--AVROBIO, Inc. (Nasdaq: AVRO) (the “Company”), a Phase 2 clinical-stage gene therapy company, today announced clinical trial updates from the ongoing investigator-sponsored Phase 1 clinical study and the AVROBIO-sponsored Phase 2 clinical trial of AVR-RD-01. AVR-RD-01 is an investigational gene therapy candidate designed to treat Fabry disease by inserting the GLA gene that encodes functional α-galactosidase A (AGA, the enzyme that is deficient in patients with Fabry disease) with the goal of enabling continuous endogenous AGA production and distribution to tissues and organs. 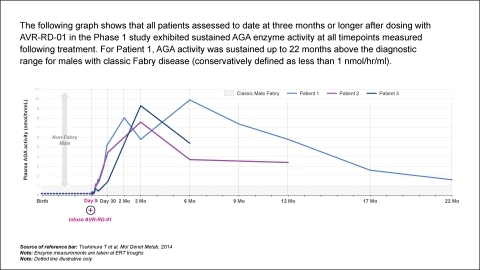 The investigator-sponsored Phase 1 study is designed to assess the safety of AVR-RD-01 in up to six patients with Fabry disease who have been treated with standard of care enzyme replacement therapy (ERT) for at least six months prior to receiving AVR-RD-01. The AVROBIO-sponsored Phase 2 trial of AVR-RD-01 (the FAB-201 Study1) is an open-label, single-arm clinical trial evaluating the efficacy and safety of AVR-RD-01 in eight to twelve treatment-naïve patients who have not received ERT. To date, six patients have been dosed in the AVR-RD-01 studies – four patients in the Phase 1 study and two patients in the Phase 2 study. Across both studies, four patients have reached the point of three-month data analysis or longer after receiving AVR-RD-01 – three patients in the Phase 1 study and one patient in the Phase 2 study. Clinical data for these four patients are detailed in this update. In the Phase 1 study: Patient 1 had AGA of 1.6 nmol/hr/ml at 22 months; Patient 2 had AGA of 3.4 nmol/hr/ml at 12 months; and Patient 3 had AGA of 5.4 nmol/hr/ml at six months. 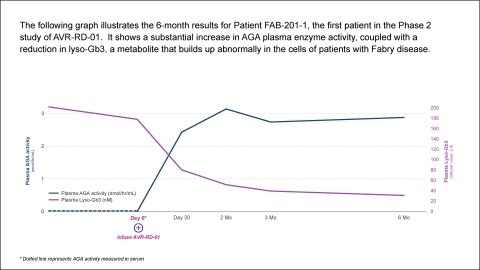 In the Phase 2 study, Patient FAB-201-1 had AGA of 2.9 nmol/hr/ml at six months. Two patients in the Phase 1 study have now discontinued ERT. Patient 1 discontinued the prescribed bi-weekly treatment with ERT at the investigator’s discretion and patient consent after the 18-month follow-up visit, and he remains off of ERT. Patient 3 chose not to resume the prescribed bi-weekly treatment with ERT after receiving the AVR-RD-01 dose. In the Phase 2 study, Patient FAB-201-1, who was ERT-naïve, had a lyso-Gb3 measurement of 31 nmol/hr/ml at six months, as compared to a lyso-Gb3 measurement of 202 nmol/hr/ml at the start of the study, representing an 85% reduction in lyso-Gb3. An additional measurement of substrate for Patient FAB-201-1 was evaluated via skin biopsy analysis, which showed a reduction in substrate inclusions in endothelial cells of the skin between baseline and at six months after treatment with AVR-RD-01. The skin biopsies were evaluated using a standard scoring system for Gb3 accumulation and clearance. The scoring system has a range of zero to 3, with a score of zero representing none or trace accumulation, and a score of 3 representing severe accumulation. This patient scored a 3 at baseline and scored a 2 at six months after treatment with AVR-RD-01, as assessed by two independent blinded readers. This tissue-related data point is consistent with, and AVROBIO believes supports, the metabolite reduction observed with plasma lyso-Gb3. 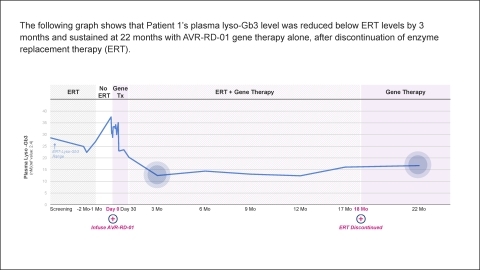 For Patient 1 in the Phase 1 study, plasma lyso-Gb3 level was reduced below pre-gene therapy levels by 3 months and sustained up to 22 months with AVR-RD-01 gene therapy alone, after discontinuation of enzyme replacement therapy (ERT) at month 18. For Patient 3, who chose not to resume ERT following treatment with AVR-RD-01, his initial lyso-Gb3 was 52 nmol/hr/ml, which decreased to 33 nmol/hr/ml at three months (while on gene therapy alone). Preliminary safety data for all patients dosed in the Phase 1 and Phase 2 studies indicate that AVR-RD-01 has been generally well tolerated; no serious adverse events (SAEs) assessed related to AVR-RD-01 were reported as of the safety data cut-off dates of January 1, 2019 for the Phase 2 study and November 26, 2018 for the Phase 1 study. Adverse events (AEs) were as expected for patients undergoing melphalan conditioning. The overall vector copy number (VCN) trends for the Phase 1 and Phase 2 studies remain as expected. For Patient 1 in the Phase 1 study, the VCN is stable between month 17 and month 22 at 0.1. VCN refers to the average number of copies of the lentiviral-vector inserted gene that are integrated into the genome of a cell. Based on over three years of development, plato™ is AVROBIO’s vector system and automated, closed, cell manufacturing solution for CD34+ cell-based therapies developed to enable worldwide commercialization of the Company’s gene therapies. Components of plato were also designed to safely enhance long-term gene therapy efficacy and durability and can potentially address the CNS manifestations that accompany certain lysosomal storage diseases. AVROBIO intends to utilize the plato platform in its gene therapy programs, starting in 2019 with the ongoing Phase 2 clinical program for AVR-RD-01 for Fabry disease and its planned AVR-RD-02 clinical program for Gaucher disease. “AVROBIO enters 2019 with strong momentum across multiple fronts. We are extremely pleased with today’s AVR-RD-01 data and look forward to presenting additional data from our Fabry studies over the course of the year. Today’s news, along with the promise of our product pipeline and plato platform, give us great confidence for the year ahead,” said Geoff MacKay, AVROBIO’s Chief Executive Officer. Data from the Phase 1 study of AVR-RD-01 will be highlighted in a platform presentation today at the WORLDSymposium by Jeffrey A. Medin, Ph.D., Vice Chair of Research Innovation and MACC Fund Chair of Pediatrics and Biochemistry, Medical College of Wisconsin. Dr. Medin is the principal investigator of the FACTs team (Fabry disease Clinical research and Therapeutics) in Canada that is conducting the Phase 1 study. AVROBIO will host an Analyst and Investor Event today, Wednesday, February 6, 2019, in conjunction with the WORLDSymposium, an annual conference dedicated to lysosomal diseases, in Orlando, FL. The presentation at the event will be webcast beginning at 5:30 p.m. ET. At the event, the Company will provide additional updated clinical data for patients in the Phase 1 and Phase 2 studies evaluating AVR RD-01 in Fabry disease, including additional substrate and metabolite levels in plasma and urine, and safety and tolerability endpoints; will highlight AVROBIO’s progress with the Phase 1 study and Phase 2 FAB-201 Study1 for its lead clinical program in Fabry disease; will further discuss the Company’s plato platform; and will provide updates on its other gene therapy pipeline programs in Gaucher, cystinosis and Pompe. For the Analyst and Investor Event, a live webcast of the presentation and accompanying slides will be available under “Events and Presentations” in the Investors section of the Company’s website at www.avrobio.com. An archived webcast recording of the event will be available on the website for approximately 30 days. Fabry disease is a rare lysosomal storage disease associated with significant morbidity and early mortality. It is caused by a gene defect that causes a deficiency in functional enzyme α-galactosidase A (AGA), which breaks down a particular type of fat in the body’s cells known as globotriaosylceramide, or Gb3. As Gb3 and other related substrates increase in patients with Fabry disease, Gb3 and its metabolites (principally lyso-Gb3) becomes toxic to the patient’s cells. Gb3 and other glycosphingolipids accumulate and result in damage to multiple tissues and organs, especially the kidneys, heart and brain. Accumulation of Gb3 in tissues such as the heart and the vascular system can lead to life threatening vascular blockages and thus to stroke and heart attacks. In addition, high levels of Gb3 substrate accumulation in the kidney can cause kidney failure. Gb3 can also accumulate in other tissues, such as the nervous system, where it leads to debilitating pain. Due to end-stage renal disease and other life-threatening complications associated with Fabry disease, the average life expectancy in affected males is approximately 58 years of age. Most patients with Fabry disease begin experiencing chronic pain in childhood but are often not diagnosed with Fabry disease until their twenties, due to a broad variation in patient symptoms. Over 1,000 gene mutations associated with Fabry disease have been identified. It is estimated that Fabry disease is diagnosed in approximately one in 40,000 males and one in 118,000 females in the United States, but studies have suggested that a larger number of patients may be undiagnosed. AVR-RD-01 is an ex vivo lentiviral gene therapy being investigated as a single-dose therapy with the potential to provide durable and life-long potential therapeutic benefit for patients with Fabry disease. AVR-RD-01 is designed to employ a state-of-the-art lentiviral vector system that is an efficient gene transfer technology for the permanent integration of functional copies of the gene into the patient’s own stem cells. In patients with Fabry disease, hematopoietic stem cells are collected from the patient, and then transduced with lentiviral vector carrying a functional version of the GLA gene that encodes active α-galactosidase A (AGA) – the enzyme that is deficient in Fabry disease – to create AVR-RD-01 gene therapy. AVR-RD-01 is then infused back into the patient with the goal of restoring normal GLA gene expression such that functional AGA enzyme is sufficiently produced by the patient’s own body. AVROBIO, Inc., is a Phase 2 clinical-stage gene therapy company developing gene therapies to potentially cure rare diseases with a single dose. AVROBIO’s lentiviral-based gene therapies employ hematopoietic stem cells that are collected from the patient and then modified with a lentiviral vector to insert functional copies of the gene that is defective in the target disease. AVROBIO is focused on the development of its gene therapy, AVR-RD-01, in Fabry disease, as well as additional gene therapy programs in other lysosomal storage disorders including Gaucher disease, cystinosis and Pompe disease. The Company’s plato™ platform is a vector system and automated, closed, cell manufacturing solution designed to support worldwide commercialization. AVROBIO is headquartered in Cambridge, MA and has offices in Toronto, ON. For additional information, visit www.avrobio.com. This press release contains forward-looking statements, including statements made pursuant to the safe harbor provisions of the Private Securities Litigation Reform Act of 1995. These statements may be identified by words such as “aims,” “anticipates,” “believes,” “could,” “estimates,” “expects,” “forecasts,” “goal,” “intends,” “may,” “plans,” “possible,” “potential,” “seeks,” “will,” and variations of these words or similar expressions that are intended to identify forward-looking statements. These forward-looking statements include, without limitation, statements regarding our business strategy, prospective products and goals, the therapeutic potential of our product candidates, the design, enrollment and timing of ongoing or planned clinical trials, clinical trial results, product approvals and regulatory pathways, potential regulatory approvals and the timing thereof, anticipated benefits of our gene therapy platform, timing and likelihood of success, plans and objectives of management for future operations, future results of anticipated products, and the market opportunity for our product candidates. Any such statements in this press release that are not statements of historical fact may be deemed to be forward-looking statements. Results in preclinical or early stage clinical trials may not be indicative of results from later stage or larger scale clinical trials and do not ensure regulatory approval. You should not place undue reliance on these statements, or the scientific data presented. Any forward-looking statements in this press release are based on AVROBIO’s current expectations, estimates and projections about our industry as well as management’s current beliefs and expectations of future events only as of today and are subject to a number of risks and uncertainties that could cause actual results to differ materially and adversely from those set forth in or implied by such forward-looking statements. These risks and uncertainties include, but are not limited to, the risk that any one or more of AVROBIO’s product candidates will not be successfully developed or commercialized, the risk of cessation or delay of any ongoing or planned clinical trials of AVROBIO or our collaborators, the risk that AVROBIO may not realize the intended benefits of our gene therapy platform, the risk that our product candidates or procedures in connection with the administration thereof will not have the safety or efficacy profile that we anticipate, the risk that prior results, such as signals of safety, activity or durability of effect, observed from preclinical or clinical trials, will not be replicated or will not continue in ongoing or future studies or trials involving AVROBIO’s product candidates, the risk that we will be unable to obtain and maintain regulatory approval for our product candidates, the risk that the size and growth potential of the market for our product candidates will not materialize as expected, risks associated with our dependence on third-party suppliers and manufacturers, risks regarding the accuracy of our estimates of expenses and future revenue, risks relating to our capital requirements and needs for additional financing, and risks relating to our ability to obtain and maintain intellectual property protection for our product candidates. For a discussion of these and other risks and uncertainties, and other important factors, any of which could cause AVROBIO’s actual results to differ materially and adversely from those contained in the forward-looking statements, see the section entitled “Risk Factors” in AVROBIO’s Quarterly Report on Form 10-Q for the quarter ended September 30, 2018, as well as discussions of potential risks, uncertainties and other important factors in AVROBIO’s subsequent filings with the Securities and Exchange Commission. AVROBIO explicitly disclaims any obligation to update any forward-looking statements except to the extent required by law. Note regarding trademarks: PLATO is a trademark of AVROBIO. Other trademarks referenced in this presentation are the property of their respective owners. 1 The official name of the ’FAB-201 Study’ is AVRO-RD-01-201, which is a Phase 2 trial of AVROBIO’s investigational gene therapy, AVR-RD-01, in Fabry disease. AVROBIO, Inc. announces updated clinical data from ongoing Phase 1 and Phase 2 studies for AVR-RD-01 gene therapy for Fabry disease.